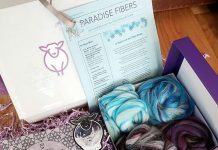 Not a member of our Fiber of the Month Club? Sign up today! Space is limited. On the very edge of Washington, in a little corner of a rocky outcropping, there is a harried purple octopus named Mrs. Coleoidea, who is trying to start her art class at the Tide Pool School for Sea Creatures. This is not going well, as the starfish are doing cartwheels, the crabs are playing “don’t touch the seafloor” with the new puffer fish that just transferred (who is happy to be part of the chaos), and the sea urchins are poking each other. Despite being a school in the ocean, there is only one regular fish, a shy tide pool sculpin named Olig. “Class! Please pay attention!” Poor Mrs. Coleoidea says, to no avail. The noise continues. “Class! Please! Don’t make me ink the tide pool up today,” she says in a warning tone. This gets everyone’s attention. Ink is hard to clean off of fins and spines. Everyone settles down in a circle around Mrs. Coleoidea. “With fiber! Uni Jr, stop poking your sister. This is Peter Iredale,” she pulls a blue blend with neutral tones from behind the rock. 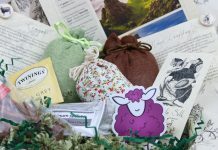 “He is made from flax – like a ship’s sail – merino wool, and mulberry silk. A 25/50/25 blend. Flax is a cellulose fiber that is obtained from the stalk of the Linen plant. Flax was one of the first crops domesticated by humankind. Linen cloth made from flax was used to wrap mummies in the early Egyptian Tombs! Commercial production of flax fiber began in the United States in the year 1753! It wasn’t until the invention of cotton gin in 1793 that flax production declined. However, flax production is still common in the Soviet Union, Poland and France. Flax has incredible properties; it cannot provoke allergies, it absorbs humidity and allows the skin to breath making it perfect for summer garments, It is very resistant, it can be washed many times without alteration and becomes softer, It is thermo regulating, anti-static, and anti-bacterial! 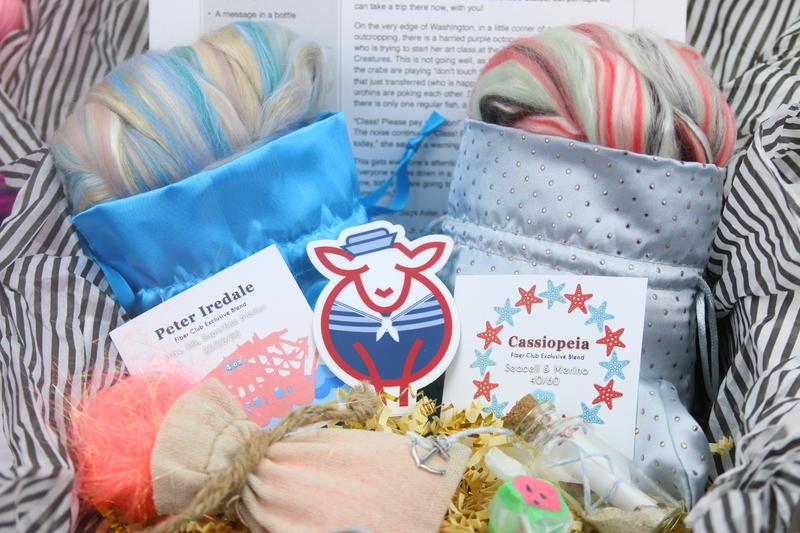 And this,” she pulls a pink, seafoam green, and brown fiber out, “Is Cassiopeia. She is made from seacell, mulberry silk, and superfine merino wool. Seacell is a new sustainable cellulose fiber that protects the skin and allows it to absorb nutrients! Made from brown algae seaweed called Ascophyllum Nodossum, also known as Knotted Wrack, which is found in the Fjords of Iceland! Manufactured in the same way as lyocell. Through a process of non toxic solvent-spinning, cellulose is dissolved directly in a solvent containing water. After washing and retting, the solution is filtered and spun through spinnerets to yield filaments! The resulting fiber is lightweight and breathable, incredibly soft against the skin, nutrient rich , moisture repellent, and naturally transfers nutrients through your body moisture. Seacell is more absorbent than cotton making it suitable for summer garments! “Is it a love story?” asks the starry eyed Aster. “Yes it is, Aster. AJ stop eating Cassiopeia,” Mrs. Coleoidea interrupts her storytelling to prevent a wayward crab from eating the tail end of her fiber. Augustus Julius slowly lowers his claw from his mouth. “But crabs are omnivores, Mrs. C. We eat seaweed,” he complains. “Oregon is just south of us,” pipes up Uni Jr.
“Why would you tell us such a sad story?” Aster asks with scorn. “Ugh, do we HAVE to! ?” grumbles Augustus Julius. “How are we going to bring Cassiopeia and Peter Iredale together?” asks a watery eyed Olig. “How are we going to blend them together?” Uni Jr asks. “And what’s core spinning?” Aj shouts. “How do you use a blending board?” Uni Jr asks. “You tear strips of fiber, and drag them down across the board from top to bottom. 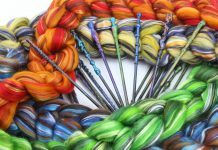 If you alternate the colors in layers, you will get a yarn that is striped like a candy cane! Then you start at the edge and roll it up into a rolag! Then you spin it,” Mrs. Coleoidea demonstrates as she explains. Click to see how to use a blending board. “Yes! Yes! Show us!” Aster’s classmates cheer. Except Augustus Julius, who is too hungry to pay attention. 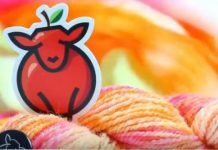 “First, you attach a leader yarn to your bobbin. Then, you set the wheel spinning and start to treadle. Make sure if you leave your yarn and come back to it that you always spin in the same direction. 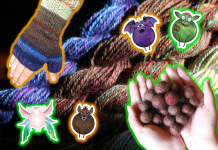 Then you spin a bit of your fiber onto the leader yarn.” Mrs. Coleoidea demonstrates as she goes through every step. One by one, the students slowly start to pedal, draft, and twist. They aren’t all coordinated or smooth, and Uni Jr gets some of Cassiopeia stuck in his spines and needs to be rescued, but for beginners they are doing very well. Soon, everyone has had a turn spinning both Peter Iredale and Cassiopeia. “Now do we put them together?” Olig asks. 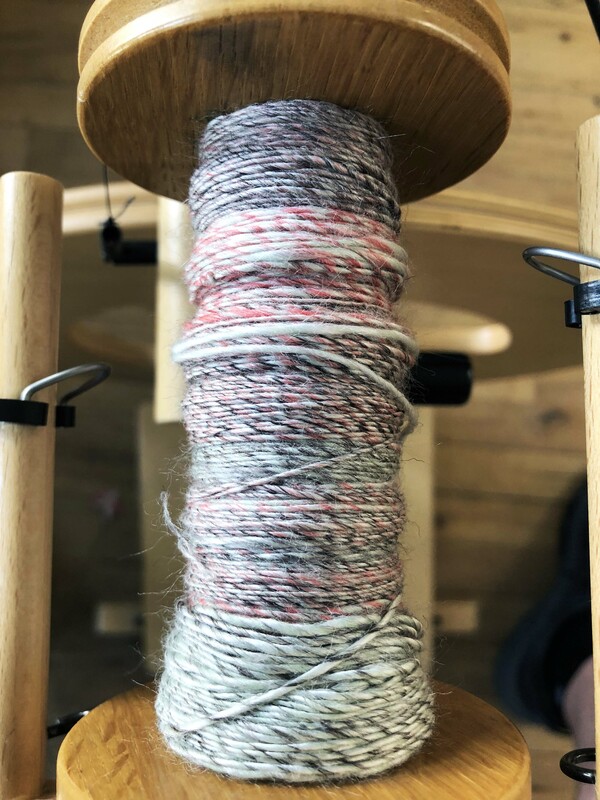 Olig slowly gets the hang of managing two yarns, and soon the bobbins are getting smaller and smaller as the yarn is plied together. Again the students take turns, doing better as they are more used to pedaling and they do not have to draft. The wonkiness of their differences in drafting skills creates a beautiful art yarn as it is plied. After a little while longer, the yarn is completely plied. “But the pacific ocean is cold in the Pacific Northwest! Our tide pool is freezing.” Augustus Julius points out. “YAY MORE SPINNING!” The class exclaims! “We will use a skein of dark purple/blue Mohair yarn. 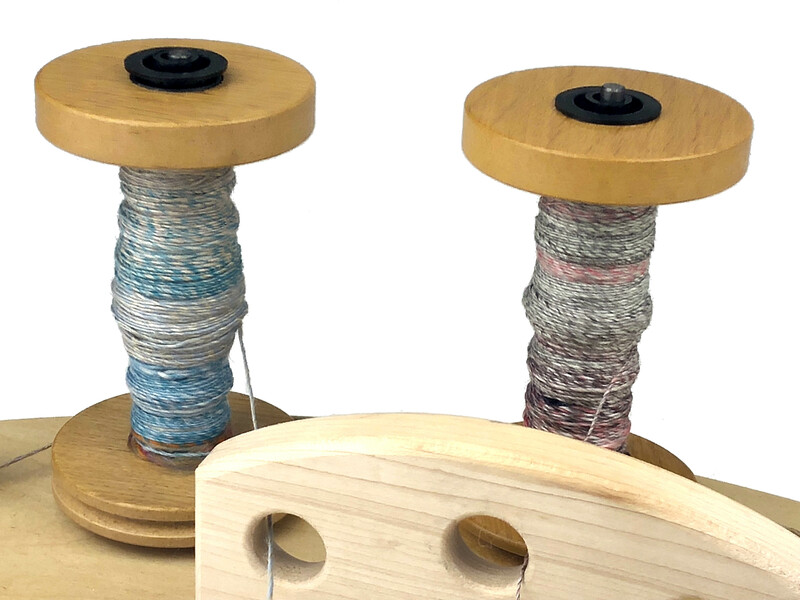 Once we attach the mohair yarn to our bobbin, we will set the cake of yarn at our side and grab a strand of fiber to spin onto the mohair yarn. While we treadle we will hold the fiber supply at a 90 degree angle, feeding it onto the mohair yarn. 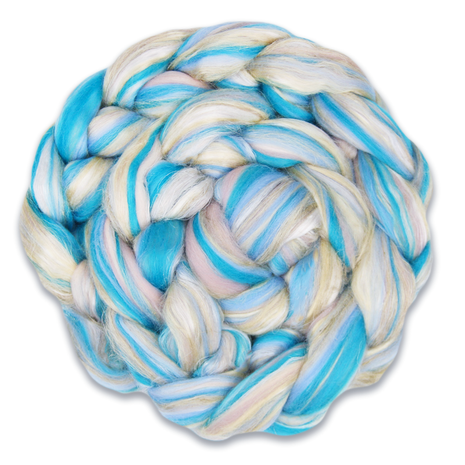 The mohair yarn is ideal to use because the fibers will easily latch onto the yarn. 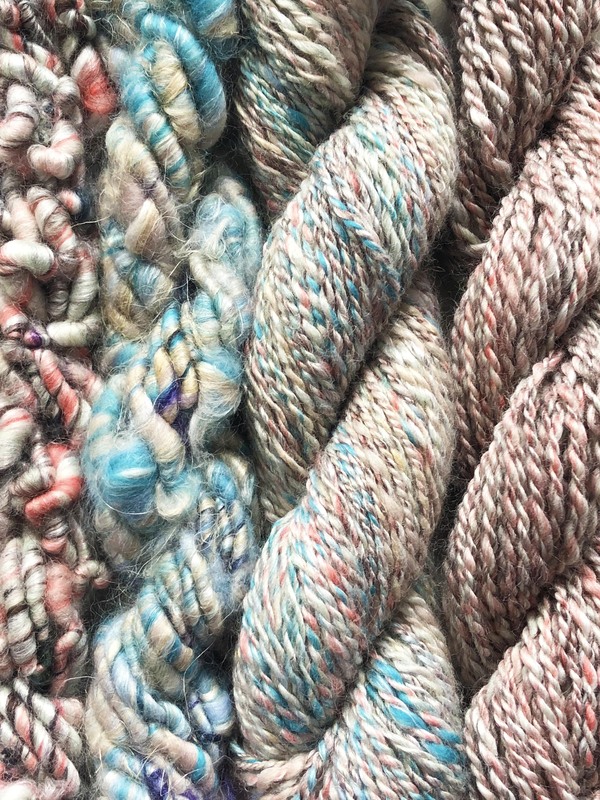 The fibers will swirl around the yarn making thick and thin spots as you draft it outward! 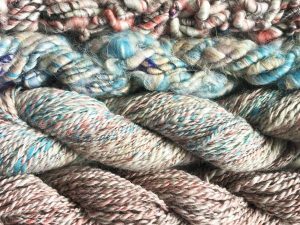 Air will become trapped between the mohair yarn and the fiber you’re drafting onto it, making a very soft and textured yarn! 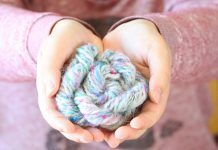 This is a fun way to show off the colors in a blend and to create a unique yarn to weave, knit, or crochet with! Now class, let’s have fun with your these new techniques!” Watch Core spinning in action here.